It is said that there is no other romantic place than Paris. 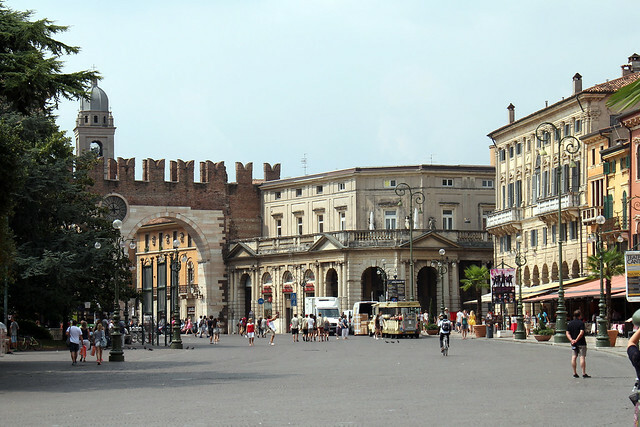 If you want to hide from the city noise, crowded streets – welcome to Verona! It doesn’t really matter what’s the reason for you to visit Italy: honeymoon, vacation, or wedding anniversary – Verona was created for that romantic aim. By the way, it is difficult to find the most suitable place for offering marriage, so what makes Verona so romantic? Everybody knows that the main city symbols are Romeo and Juliet – Shakespeare’s characters. Even the tragic final of this play cannot stop the tourists from making this place more and more romantic every year. True love of that young pair is still considered as the symbol of clarity and sincerity. So, let’s start to meet Verona. Do you want to become a hero of the Middle-aged novel? Then you should book a room at the luxury Due Torri Hotel. 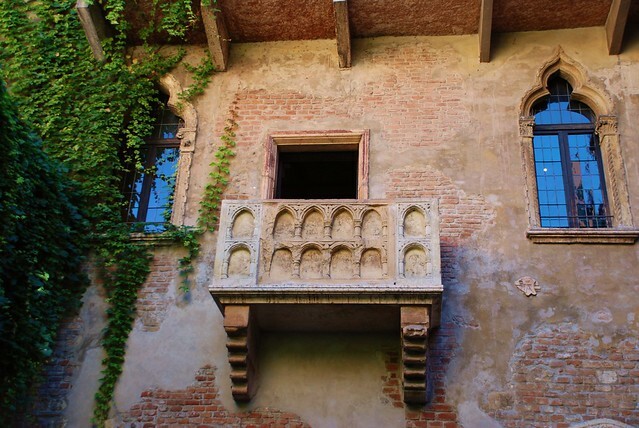 This palace was built in the 14th century, situated in the very heart of Verona near the Santa Anastasia church, about 15 minutes away from the glorify balcony of Juliet. As far as this hotel, it was built in 1674, you can feel its ancient atmosphere here. By the way, you can find the great halls, full of valuable sculptures, art samples at each floor. The rooms, your apartments, are unique: gracile furniture, beautiful lamps made of murano glass, shiny flooring, and scene paintings. Are you impressed? If you want to spend your romantic weekends in Verona, you can also book the apartments in Romeo e Giulietta hotel – a ritzy hotel, named after Shakespeare tragedy. The happy day in Verona you may start from traditional visiting the antic amphitheater – Arena di Verona. This huge construction was listed on the number of the World heritage monuments, being the biggest amphitheater in the world. 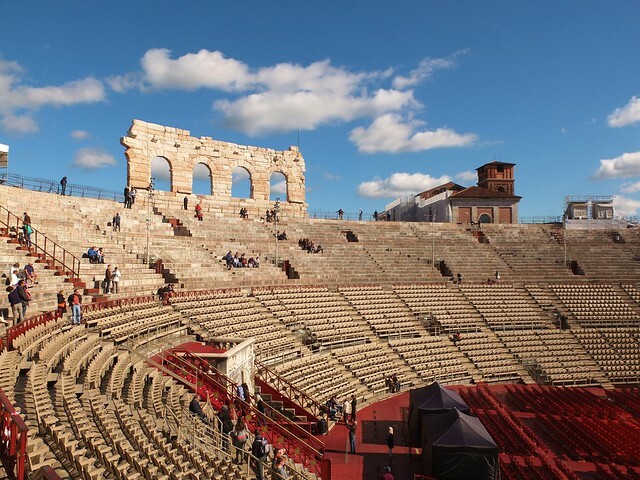 Make a notice that Arena di Verona is considered as the most prestigious summer opera theater: a great number of famous singers has appeared on this stage during the last 100 years. Thousands of people come to Verona every year to visit opera, booking tickets beforehand. Walking down the Stella Street, direct your steps to the most popular building in the city – the house where Juliet lived. This building became the prototype for the world-famous Shakespeare’s tragedy. You can see that balcony, where young and beautiful Juliet met her Romeo. The house is opened for visitors: the tourists can look over her bedroom, a nice patio with the Juliet memorial there. Enjoying this place, try to touch the bronze statue, asking for a true love forever. One more thing for tourists: within walking distance of Juliet house there are Archeological museum and Teatro Romano di Verona. You can get there by bus, or by car, if you prefer a comfortable way of traveling. Let’s come back to the historical center of the city, especially to the Piazza Erbe. The center of souvenirs’ trade is situated here. You can buy not only the traditional souvenirs, but Italian sweets, famous ice-cream. You should dine exactly over the Piazza Erbe, visiting one of the numerous cozy restaurants and cafes with the outdoor stages. Let your choice stop at the restaurant Filippini, which began its tasty history since 1901. Lasagna and pasta costs about 9 EUR here. The price for soup is 8 EUR, salads for 13 EUR. 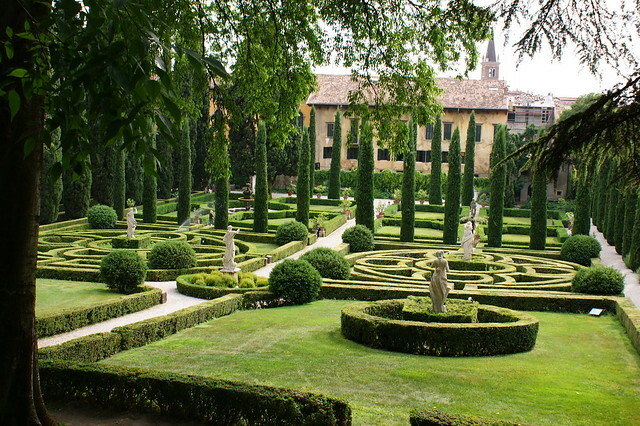 Your walk proceeds to Via Giardino Giusti, with the noble aim to visit a Guisti Garden. This park landscape is situated on the other side of the Adige River. You can easily get there by bus, or hiring a car. The place is really worth seeing! There’s lots of beauty around here: fountains, marble statues, ancient palace. What impresses the most is the cityscape you can observe from the special open platform. It costs about 5 EUR, not a penny more. For those people who like traveling comfortably, it would be better to hire a car at the very beginning of the trip. Otherwise, you should catch the bus on exit to the garden, going to the Museo Civico di Castelvecchio. If you please, 26 halls full of paintings, sculptures, frescos and other architecture monuments dated of Middle-aged period is waiting for you. The palace was built about 700 years ago. You can visit this historical heritage just for 8 EUR for adults and 1EUR for children. After your museum excursion program is finished- it’s time to promenade in the streets of the evening city – romantic Verona. It’s time to have a supper in a calm and pleasant restaurant, like Antico Caffè Dante, which is situated on Piazza dei Signori, 2. The popular dish here is Italian risotto and meat platter. The main course here costs about 13-20EUR, just as coffee is about 5-8EUR. 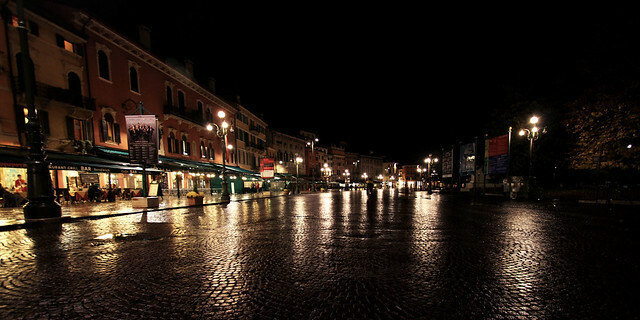 The city is famous of not only its sugar romantic atmosphere, but the stormy night life. It’s a pity, but the most popular night clubs, such as Berfi’s Club and Alter Ego are far from the historical center. The taxi will cost about 20-25EUR, exclusive the entrance ticket. You should try the popular Spitz cocktail, made of champagne – the most suitable drink to keep the atmosphere of your romantic evening going. The average price for longs is about 10-14EUR, for shot-drinks – 6-8EUR. Generally speaking, you’ll like Verona in Italy. Beginning with the romantic Shakespeare’s tragedy, the city is very beautiful and impressive. What is the most favorable for tourists is the unique opportunity to see the city sights all together for one day, just walking or driving through the city as well. If you are planning to stay here for a couple of days, you should go to Lake Garda, visiting the Parco Giardino Sigurta and the wild animal park Parco Natura Viva. It cannot damage you romantic attitude, but making your trip more interesting indeed.